Although pumpkin is usually the flavor of autumn, this is a great recipe that can be prepared all year long. It’s easy to make and takes very little time. Pumpkin ravioli with brown butter sauce is comfort food without the guilt. The sage and nutmeg add a nice addition to this recipe. The sweetness of the pumpkin is balanced well with the brown butter sauce. I usually serve this at dinner with a side salad. I am a big fan of autumn dishes and anything with fresh herbs used as a seasoning. 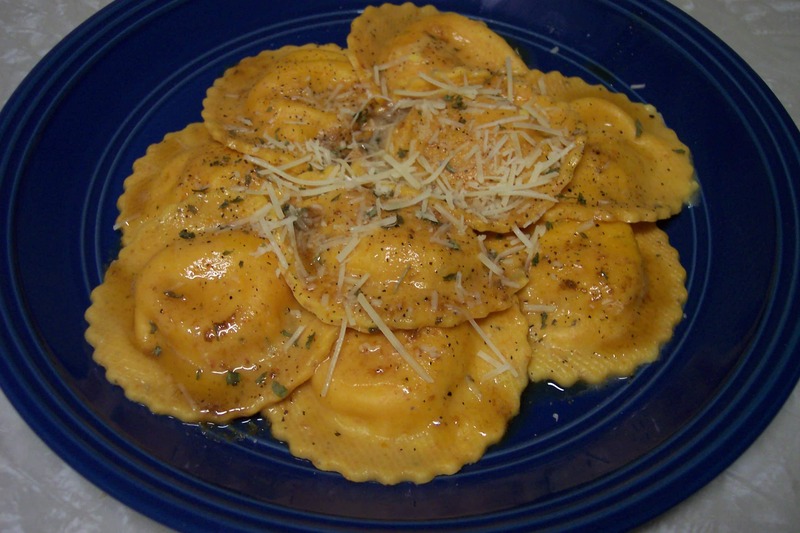 Pumpkin raviolis can be prepared all year round and make a great main course. Follow instructions on package for raviolis (Usually takes about 3-4 minutes or until the float to the top). Remove ravioli from water with large slotted spoon and place on serving dishes. In a small sauce pan, melt butter over low heat (If the heat is too high butter will burn). Whisk butter until it is nut brown, remove from heat. When butter just begins to sizzle, add sage and nutmeg for about 20-30 seconds. Pour butter sauce over the raviolis. Season with salt and pepper.